While Natisiens have their traditions associated with their native life, Inersiens aren't so religious. Both, however, believe in an afterlife and there is a vast abyss that separates our world from the world beyond. If you are too selfish, you could get lost in the abyss becasue you can't focus on anything outside of yourself. Those who "lived well" (i.e., contributed much to society), will be able to traverse the abyss an onto the other side, where they will wait for judgment where you judged according to your works. The Inersiens refuse to speculate what happens, but the Natisiens believe that if there is a body, then the selfless Natisien could come back to help protect the city. If they like the leader and how the city is run, they will bury the bodies in a mausoleum under the city wall. If they aren't happy, they will cremate instead. Inersiens, on the other hand, believe that they must travel the abyss. While they're not sure if you can come back if there's a body, they cremate, just in case. Theoretically, Inersiens who can manipulate energy can also "cast" their souls (consciousness) out before death, but it's believed that this would be a travesty, forcing the casted soul to aimlessly wander the realms, being neither here nor there, everywhere and nowhere, unable to influence anything around them. Bonus Note: Inersiens have rescued others from the brink of death by reaching for the consciousness just before they leave the body. 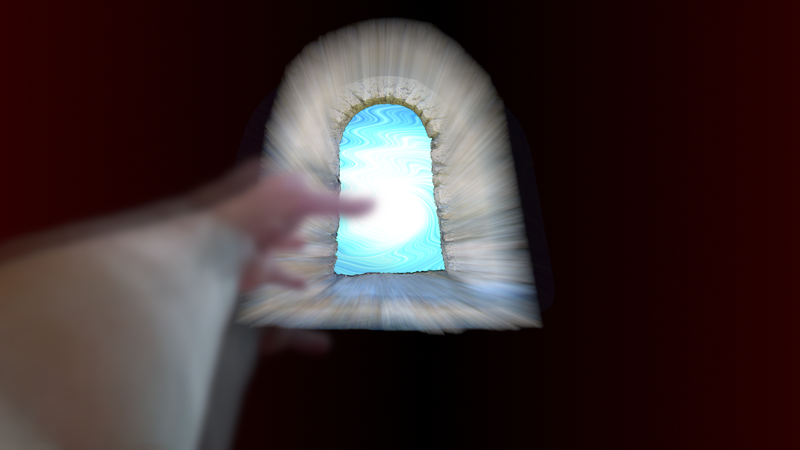 Those who come back say they feel like they're falling from some sort of doorway, depicted in the image.